Seventy-one percent of all Americans haven’t heard of the Move Over Law, which requires you either move over to the neighboring lane or slow down to below 20 mph below the speed limit while passing an emergency roadside vehicle with flashing lights. Why this new law, effective in forty-seven states as of January 1, 2010? According to the National Law Enforcement Officers Memorial Fund, 154 police officers have been struck and killed by motor vehicles while roadside since 1999. Our need for safety supersedes our need for speed. So the next time you see those flashing lights, move it over and slow it down. You could save a life. What better way to do that than in slow style? A hearty thanks to PM4Girls’ Elizabeth Harrin for a rocking review of The Power of Slow. [I]t is a useful book about the principles of working within the boundaries of time…[If you want to] really get to grips with what time means for you, in the workplace and at home, then read The Power of Slow. Dedicated to the discipline of project management, Elizabeth is a stellar thought leader. I appreciate her work a great deal. Oh, and did I mention she’s giving away a copy of The Power of Slow on Friday? So be sure to visit her blog then. Our lives can be viewed as one big project. Or in PM-speak, a series of projects that make up a program. What do we want to accomplish? How can we reach our milestones? Slow down to take a look at the Big Picture. Consider it the very canvas you were born with. Now pick up that brush and paint. This is your life. You get to choose how colorful it is. A thousand thanks to the Brazen Careerist Penelope Trunk for her blog love yesterday. And welcome to all you new visitors who might have found your way here through her. I’ve heard from a few of you already (thanks @btwendel, @bloomerbride and Tracey Linkous in particular). So what is the power of slow? It really is about mindfulness. It is about moving beyond clock combat to embrace time as friend. Time is indeed all we have. Kudos to Samantha Jones for this quote, which I totally lifted off her Facebook page and plopped here. As Survivor enters its 20th season, I have to ponder the human desire to push the envelope, if you will. We are designed, on some level, to test our limits. Ask any three year-old. He’ll tell you. It’s funny watching Mommy get all purple in the face as I teeter on the edge of the sidewalk into oncoming traffic. Nice one. If you are reading this, you are most likely in the privileged position of deciding now whether to live or just survive. We have enough food, clothing and shelter to make more than a difference in the world. We have access to the very technology that can change it for the better. So what does living, and I’m saying rock-the-house-like-there’s-no-tomorrow kind of living, mean to you? Does it mean staying safe within the walls of your comfort zone, or does it mean doing that one thing each day that scares the crap out of you, then leaves you breathless as you realize it wasn’t all that bad? You are more powerful than you can imagine. What will you do with your power today? In this TED Talk, Seth Godin shares his insights about how to create a movement. It is no longer about advertising and selling someone something they don’t already have. It is about connecting people who are interested and leading them down the path of transformation. 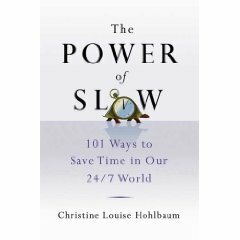 So if you are committed to mindful living or know you need to make a change in your life, you can start today by telling others about this blog, about my book, The Power of Slow, and about how they can live a more powerful life by embracing, not combatting, the clock. Looking forward to hearing about how it goes for you!